A new quilt exhibit is now on display at the Mitchell County Historical Society Museum, located at the Cedar River Complex. The quilts come under the talents and tutelage of Jean Arndt of Osage. Two quilts were created by Arndt, while others have sentimental significance; others were created under her direction. One quilt, “Poinsettias” was sewn by Jean’s sister, Linda Viani. The quilt fascinates, with its detailed applique work and hand sewing. Another quilt, which Arndt entitled, “Push Your Limits Quilt,” was designed by Arndt for fellow members of the Cedar Valley Quilt Guild, so they would “push their limits” and talents. “I used patterns from different sources incorporating curves, needle turned appliqué, machine appliqué and paper piecing,” Arndt said in the quilt’s description. I gave members the instructions for three patterns every month starting in November of 2009 and finishing up September of 2010. 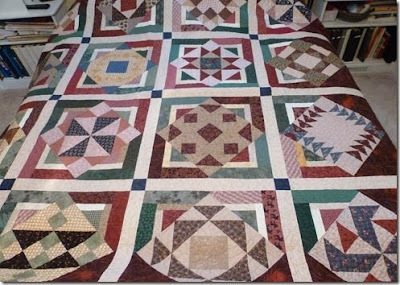 It was quilted by Mindy Prohaski of Nora Springs. 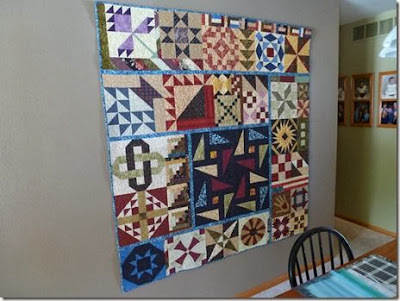 Another quilt was created by sampler blocks made through a class at The Fabric Shoppe in St. Ansgar, in 2004, and then sewn by Arndt. 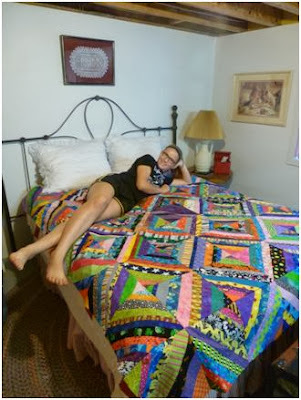 The quilt was machine-quilted by Marian Enabnit of Clear Lake. “This class was called a $5-A-Block-Class. The first month you would pay your $5 and in return I would receive the directions and the fabric for one block. The directions and fabric for the next month’s block would be free if I attended the next month session with finished block from the previous month. Also in the collection is a quilt created by Arndt’s 8-year-old-granddaughter, Jaelyn, and another fashioned by Jenna Plotzke, Arndt’s 4-H student.